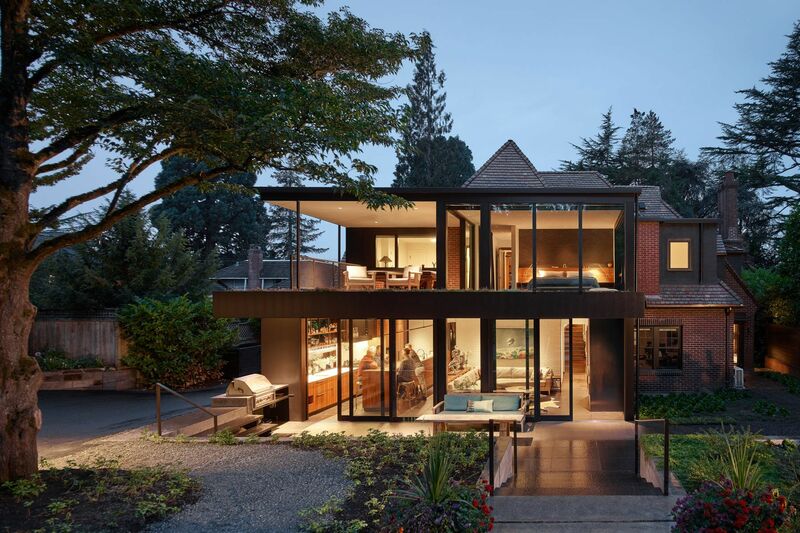 Like many older homes, this 4,800 square foot brick manor turned its back on a park-like half acre lot in Seattle’s Capitol Hill neighborhood. 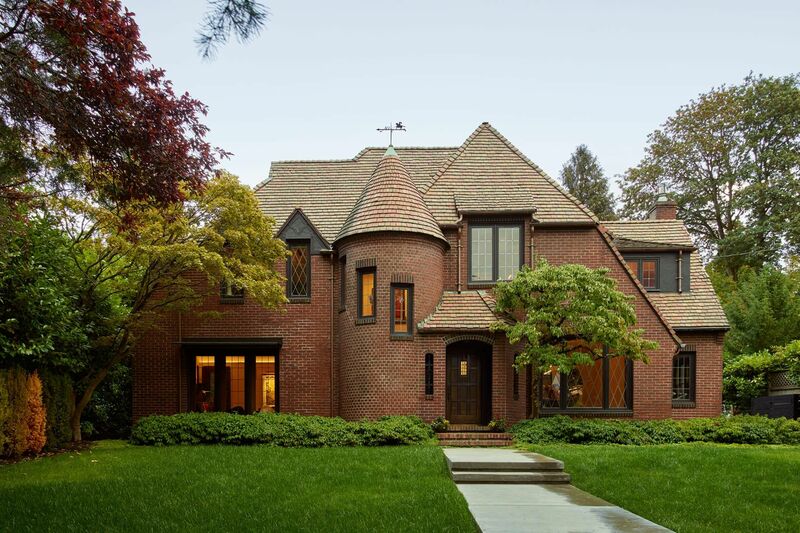 With appreciation for the historic woodwork, craftsmanship and materials, we wanted to preserve history while transforming the home to connect indoor spaces directly to the expansive back yard. All photography by Kevin Scott. The new addition extends from and expands an existing flat roof dormer. Aluminum plate siding marries with brick, glass, and concrete to tie new to old. A modern conservatory was the concept for a new addition that opens the house to the backyard. A new Kitchen and Family Room open to a covered Patio at the Ground Floor. The Upper Floor includes a new Bedroom and Covered Deck. A faceted blackened steel fireplace mass anchors this room that opens to the patio and garden beyond. Basalt floor tile extends indoors and out. A painted brick wall marks the transition from new to old. The Kitchen extends outdoors to a custom stainless steel barbecue area and steps lead from the patio up to an outdoor dining pavilion beyond. 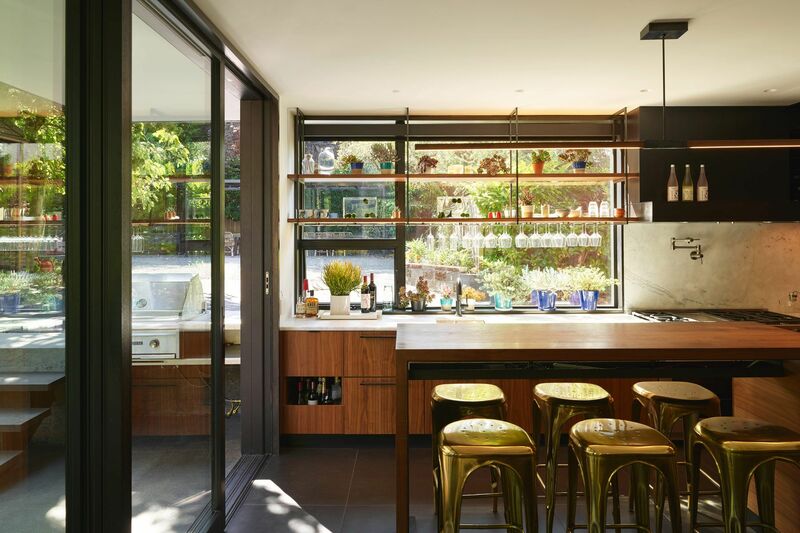 Seating at the solid walnut Island creates space for informal meals, gatherings and work. Custom blackened steel and walnut shelving with laser cut steel glass racks extend in front of a south facing window. Countertops and backsplash are honed marble. The new Kitchen opens to a covered patio and barbecue. The island provides space for work and seating. Blackened steel and Walnut shelving with integral glass racks front a south facing. Basalt tile flooring runs indoors and out to the patio. The transition between old and new is evident in the hall. The soft arched opening leads to the existing Dining Room. 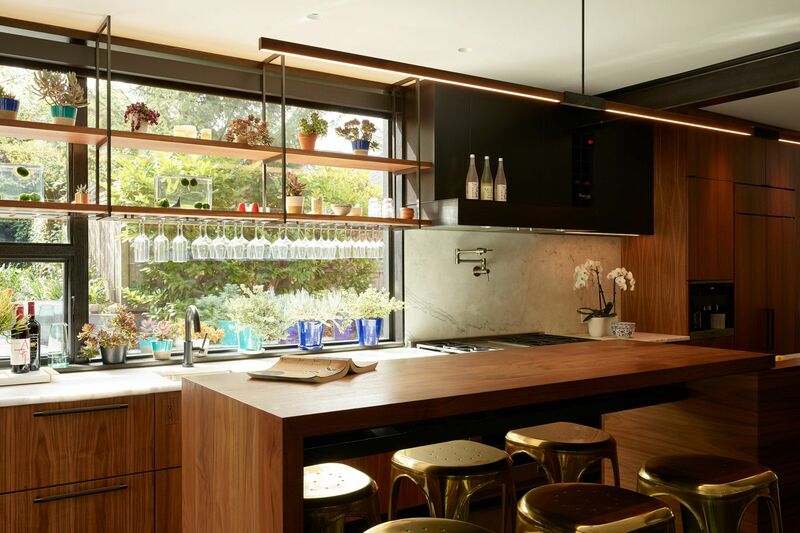 The angular walnut cabinetry of the Kitchen leads into to the new addition. A new archway was added to connect the existing Dining Room to the new Kitchen behind it. A Christopher Boots lamp hangs over the dining table. Lighting was integrated into a new cove moulding to uplight the arched ceiling. A new faceted blackened steel fireplace surround and gas burner open the fire to the room. Existing wood floors throughout the house were stained darker to match the tone of the existing mahogany door and window trim. The house is personalized with the owner's collection of modern Chinese art and Asian artifacts. This piece is illuminated with a custom art light. Continuous LED lighting is integrated into a cove moulding to uplight the arched ceiling. 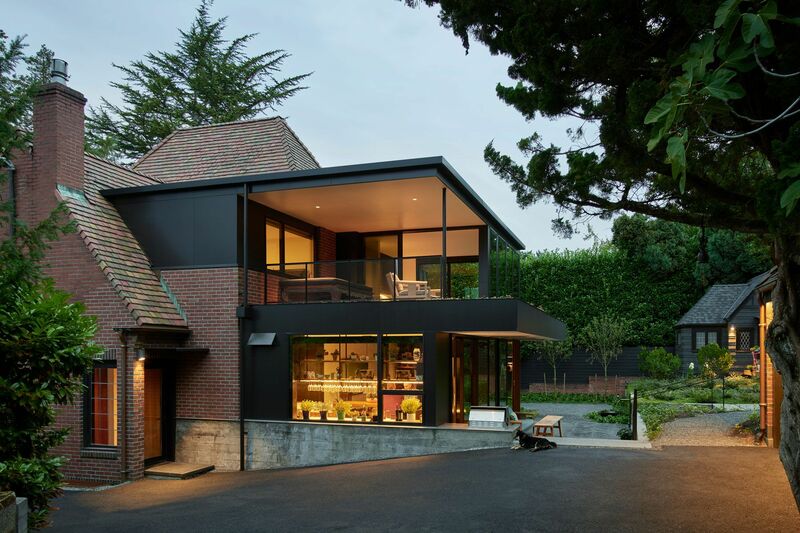 The sculptural soft curves of the existing home contrast with the modern additions. All existing woodwork was restored. The Upper Hall is a spacious gallery for art. The Bathroom layout is open and linear. A long vanity with medicine cabinet storage above is opposite full height Walnut storage cabinets. A new wet room with plaster and marble tile walls has a shower and a custom marble soaking tub. The plaster Wet Room includes a custom built marble ofuro soaking tub. The Dressing Room was opened up to provide more space and light. Custom Walnut wardrobes, dresser, and shoe bench provide clothes storage. The blackened steel fireplace creates a warm focus for lounging. The new Bedroom and Covered Deck provide expansive views of the backyard. A green roof border extends the room and deck into a dynamic landscape of multicolored succulents. The backyard includes new seating areas and converted accessory structures. An existing detached garage becomes a Bath House with a new hot tub area behind it. A child’s playhouse has been remodeled into a guesthouse. The cottage includes a bedroom with built in wardrobe and a bathroom. Ceilings were vaulted to maximize height.